Developed dan hosted by Universiti Utara Malaysia, the discovery service is now available at http://aunilo.uum.edu.my/. Universiti Brunei Darussalam Library will be hosting the 12th AUNILO Meeting from 23rd to 25th May 2016, which will be held at the Institute for Leadership, Innovation and Advancement (ILIA), UBD. 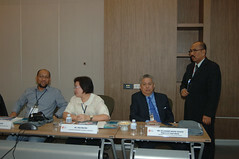 The meeting is coordinated by the AUNILO Secretariat and the ASEAN University Network (AUN) Secretariat. The theme of the meeting is Enhancing Electronic Resources Capacity in Libraries: Addressing Trends, Issues and Challenges, which will focus on how libraries can make continuous assessment of electronic resources in university libraries and promote awareness and visibility among their users. They will also look at the need to explore and identify best practices and possible areas of cooperation or resource sharing amongst its members in an effort to enhance the electronic collection and services provided. The meeting will start with a keynote address by Dr. Peter Sidorko, University Librarian, from the University of Hong Kong, with the theme Digital duress: challenges and opportunities in Hong Kong academic libraries, followed by a presentation on Introduction to ASEAN Cyber University Project and KERIS by Dr. Cholstis Dhirathiti, AUN Deputy Director. There will also be presentation of country reports by each of the AUNILO member county. Twenty-three universities of the AUNILO countries will be attending the meeting represented by the Library Directors, Chief Librarians and Executive members of AUNILO. In conjunction with the meeting, a workshop will be held from 26th – 27th May 2016, with a theme Evaluation and Assessment of Electronic Resources in Universities Libraries. This workshop will be facilitated by Mr. Heng Kai Leong, and Ms. Tamera Hanken, both from the Singapore Management University, and a senior librarian, Merhane Mohamed Salleh, from the Universiti Brunei Darussalam Library. 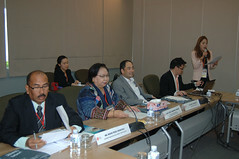 The workshop has been designed to assist the participants to evaluate the usage of eResources continuously specifically in meeting their institutions’ ROI; to be able to share best practices in evaluating the eResources with the users in mind and ensuring their libraries’ collection development policies are in line with the current trends in acquiring eResources. The targeted audience for this workshop will be library directors, chief librarians, senior librarians and other professional librarians.